Recently, I was planning an offsite retreat for a team with a significant number of new members who didn’t know each other very well. The first goal was to help them learn about one another beyond their public resumes and job descriptions. The second goal was to play and laugh together. When people feel seen and understood, and have fun together, work becomes a more human place. Jenga is just about the simplest game you can imagine. Take 60 rectangular wooden blocks, stack them into a tower, and then take turns removing one block at a time without causing the tower to collapse. It’s a game of escalating risk and calculated choices! In the spirit of playful familiarity, I thought to myself, what would happen if, after removing a block successfully you had to answer a question written on the block? * Team members’ answers to simple questions often led to conversations about values, and personal identity. In other words, the questions launched a deeper inquiry about one another. * People laughed a lot. We know from neuroscience that laughter triggers the release of endorphins which are the brain chemical associated with social bonds. Sharing personal information with receptive listeners increases psychological safety, an essential condition that helps people feel like they belong and can trust each another. So, if you would like to create your own version of Truth and Jenga, buy a set at your local toy store. They come in regular or jumbo-size. You’ll also need a fine-tip Sharpie pen to write an interesting question on each block. Be sensitive to cultural and gender assumptions as you create your questions. Here are 15 sample questions to get you started. Have fun! 2. If your home was on fire and you could save just one personal possession, what would it be? 3. What superpower would you most like to have? 4. If you had one month off work and unlimited money, what would you do? 5. If you could interview anyone living or dead, who would it be? 6. What activity recharges you or makes you smile? 7. What’s one talent you have that others here don’t’ know about? 8. What is the name of one of your favorite charities? 9. What would you like to be famous for? 10. What’s the last movie that made you laugh or cry? 11. What’s the most recent book you’ve read? 12. In what Olympic sport would you most like to win Gold? 13. What characteristic do you most admire in others? 14. What country do you dream of visiting? 15. What’s one word your closest friend would use to describe you? What trust building question would you add to this list? This is a wonderful idea! Thank you for sharing. Just ordered mine! am going to play with the kids and friends too! Thank you Larry – perhaps we can play together too! I’d enjoy that! Let me know how it goes. You are really awesome Larry, thank’s for sharing!! Amazing idea Larry!! I see a lot of potential! Larry, how often do you play Jenga? Not very often — once a year? 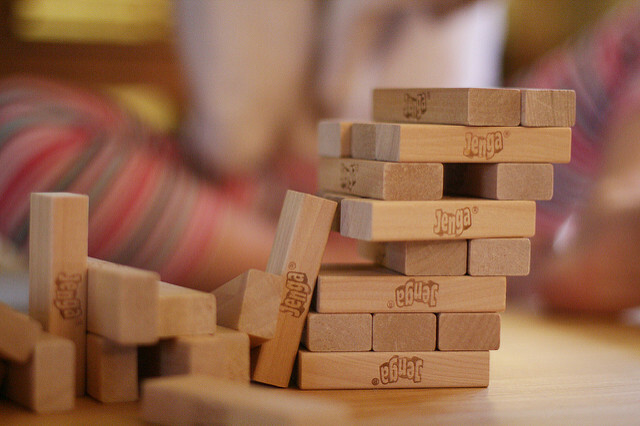 Nice article, jenga is great fun for all, can be played inside and outdoors. Good idea to use it in team building.